You seem to be like a god. Whe the roaming over the steppe? For Gilgamesh of may deeds lives there. You are so like him. The truth of what she said. Led him like a child. Which is in the sheepfold. Thronged round the wild man. And like the star-essence of the Sky Father An, his strength is more powerful. That he might eat of their produce. Which he sucked in the wilds. Bread was set before him – he knows it not. Beer was set before him – he knows it not. It is our de in life. Ate until he was full. Seven cups of it (1). Why do you run to and fro with the beasts of the steppe? ‘Come, Enkidu! Let us go to the place of the sheepfold (2)’. And like a god was his countenance. ‘Look how he resembles Gilgamesh in his appearance! He is small in size but extremely strong in his bony frame. He examined it and was puzzled by the bread. They set beer before him. He was puzzled by the beer. That you will be worthy of godliness! And indeed seven jugs of it (4). The hair of his body. And thus he became a man. Look! He is like a man! So the shepherds might have peace at night. And the chief cattlemen could rest. ‘I am a man now. I can drink strong drink. But I have the strength of he who roams the steppe. I am stronger than you. You see I capture lions. Because of me the chief catlemen can lie down. He felt good in his heart. ‘Sir, where are you going? Even into it has he intruded! Set aside rules and laws for wedlock! On the city he heaped shame! Upon a city helpless to resist. He may mate with any new bride. Before the lawful husband may have her. In their wisdom, by their will. The face of Enkidu paled. ‘This cannot contine to be! I will go to ramparted Uruk. ‘He is like Gilgamesh in form! He is a match for Gilgamesh! For all who are honourable! 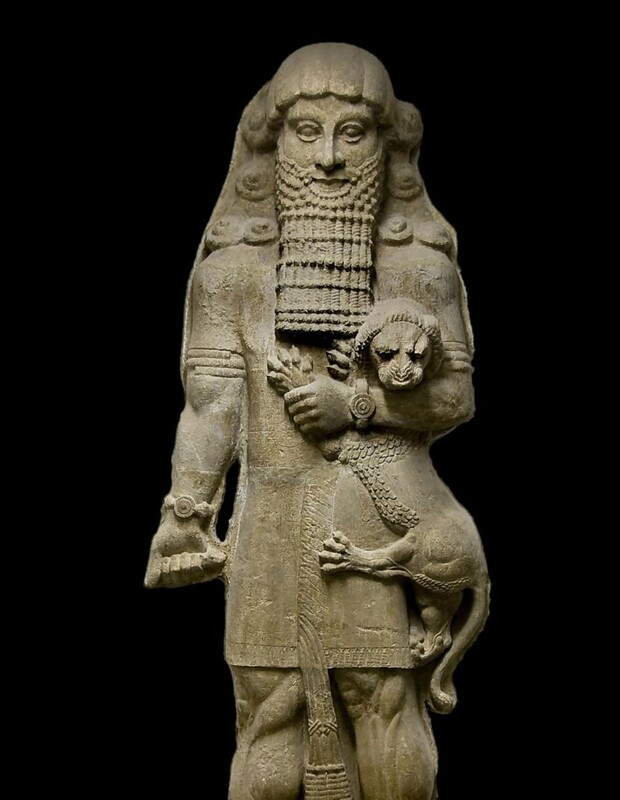 With his equal, Enkidu of the steppes. Like unto Gilgamesh to the hair. And the wall shook with this fateful act. They battled in the market. 1. Seven cups or seven jugs (see 1988 fragment) are symbolic, representing the sacred number of the seven initiatory planets, i.e. the Moon (Nanna/Sin), Sun (Utu/Shamash), Venus (Inanna/Ishtar), Mars (Nergal), Earth, Saturn (Ninurta), Mercuri (Nabu) and Jupiter (Marduk). 2. The ‘sheepfold’ was probably a reference to the rites of the Shepherd, or the King of the Land (See Tablet IV, note 1). 3. Eating of the bread and drining of the superior form of beer constituted probably a ritual of some kind, intended to prepare a candidate to the role of king and priest, a combination that was routine these days.